You’re always wearing your Fitbit, so why not give it the power to make payments? Simply add your eligible IMB Visa Debit Card to your Fitbit Wallet using the Fitbit app dashboard. 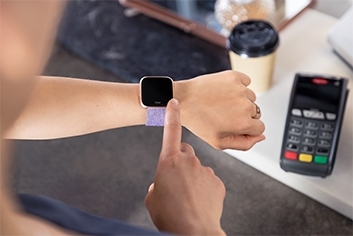 You can tap and pay with your Fitbit watch anywhere contactless payments are accepted. Your card information is not stored on your device or shared with vendors. With your device nearby, from the Fitbit app dashboard, tap the Account icon > your device image. Follow the on-screen instructions to add your IMB Visa Debit Card. In some cases, your bank may require additional verification. If you’re setting up Fitbit Pay for the first time, you may be prompted to set a 4-digit PIN code for your device. Note that you also need passcode protection enabled for your phone. After you add your card, follow the on-screen instructions to turn on notifications for your phone (if you haven’t already done so) to complete the setup. Hold your device near the payment terminal to pay. If prompted, enter your 4-digit PIN code. If the purchase amount exceeds $100 AU, follow the instructions on the payment terminal. If prompted for a PIN code, enter the PIN code for your card (not your device). For every purchase you make with Fitbit Pay and IMB Visa Debit Card between 30/01/19 and 24/04/2019, you'll get an entry into the draw to win up to $2,000 cash into your nominated IMB account. Terms and conditions apply, see important information below. Want an IMB Visa Debit card? Bank your way with IMB’s Everyday Unlimited Account. Access your money when you want to without worrying about transaction fees when you use IMB’s wide range of channels. 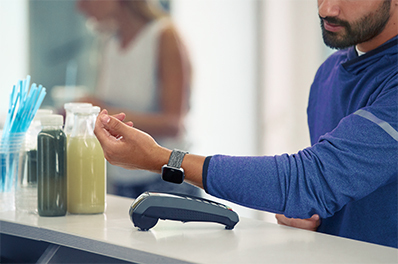 With Fitbit Pay, you can add your credit and debit cards to certain Fitbit devices. Make contactless payments right from your device – even when you’re traveling internationally. Which Fitbit devices support Fitbit Pay? Fitbit Versa: turn your watch over and look for “Fitbit Pay” in the text surrounding the heart-rate sensor. Fitbit Charge 3: remove the bottom band and look for “Fitbit Pay” printed on the end of the tracker. 1. A person will get one entry for each transaction linked to their IMB Visa Debit Card when they Tap and Pay using Google Pay, Samsung Pay, Garmin Pay and/or Fitbit Pay. Refunded transactions are excluded. All entrants must have an actively provisioned IMB Visa Debit card on their digital wallet at the end of the promotional period. This competition is open to all Australian residents. 1st prize $2,000, 2nd prize $1,000 and 3rd prize $500 will be paid into an IMB account chosen by the winner within 30 days of the draw. Entries open 12:01am, 30/01/19 and close 11:59pm, 24/04/19. The draw will take place at 3:30pm, 08/05/19 at 253 - 259 Crown St, Wollongong, NSW 2500. The winners will be contacted by telephone on the day of the draw. IMB's 'General Conditions of Entry into Competitions and Promotions and Competitions held by IMB Ltd' and full promotion special terms and conditions are available at imb.com.au. Authorised under NSW Permit No. LTPS/19/31315 and ACT TP 19/00079. Please consider the PDS available from IMB in relation to IMB deposit products and facilities. Terms and conditions apply to the use of Fitbit Pay. 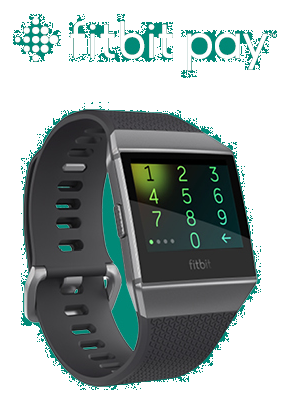 Fitbit®, Fitbit Pay™, Fitbit Ionic™, Fitbit Charge 3™ and Fitbit Versa™ are trademarks or registered trademarks of Fitbit Inc. in the U.S. and other countries. Google Pay is a trademark of Google LLC. Samsung Pay is a trademark or registered trademark of Samsung Electronics Co., Ltd. Garmin Pay is a trademark of Garmin Ltd. or its subsidiaries. IMB Ltd trading as IMB Bank. ABN 92 087 651 974. AFSL/Australian Credit Licence 237 391.